We knew from the beginning of the day that it would be an all or nothing day. It was one of those situations where the CAPE was over 5000 J/kg, and helicities were around 300 m^2/s^2. The problem was that there was a strong cap of about 12 to 14 degrees C at 700 mb. This is normally considered a near unbreakable cap, but we had a strong system moving in from the west. We figured that if the cap broke, it would be along the warm front and as close to the low as possible. We decided to chase in that area, which we forecasted to be just to the northwest of Waterloo, Iowa. We started out the chase in Cedar Rapids, Iowa. We decided to leave around 3:00 PM and head northwest on Interstate 380 toward Waterloo. After examining the skies, we decided to position ourselves just outside of Allison, Iowa, which is just northwest of Waterloo. We stopped to watch the sky and wait to see what was going to happen. We figured that if storms were going to fire, they would either fire right on top of us or really close by. At this time, the triple point was moving closer to us, and the clouds were developing more vertically. This was when we knew that the cap would actually break. Less than an hour later, the storm almost right on top of us had broken the cap. We moved to the east to get a better look at it so we could assess the situation. It appeared the storm was trying to organize itself, but it seemed like it was having a hard time doing so. There was another storm off to our south that looked like it was in better shape. This is the one that we decided to chase. We headed east to Waverly, which is about 15 miles NNW of Waterloo, and then south on Highway 218. While still in Waverly, the following warning was issued over the weather radio at 6:30 pm by our clocks. We continued to take Highway 218 to the south toward Janesville, which is six miles south of Waverly. At this time, we were receiving light rain, which turned out to be the only precipitation that we ran into that day. As of 6:38 pm, we were 4 miles to the north of Janesville with the storm to our WSW. Around 6:48 pm, we were at the intersection of Highway 218 and C-57. We noticed a rotating lowering to our west. We realized that it was pretty close to us and that we needed to get to the east a little. So we turned left onto C-57 and tried to watch the lowering behind us. Because of the rotation, it was no surprise that a tornado warning was issued for our area. At 6:52 pm, we turned right on Highway 63 and drove south. We wanted to position ourselves so that we were exactly east of the storm, and if anything, ever so slightly to the south of the storm. We figured that being directly east would give us good contrast because the storm was backlit by the sun. By 6:55 pm we were just to the north of Waterloo near the intersection of Highway 63 and C-66. We decided to stop and watch the storm. At this time, the storm appeared to be about 5-7 miles to our west. We felt safe where we were because we had a road option allowing us to continue south and another option allowing us to go east. This lowering had incredible rotation with it. There was a lot of inflow into the storm. Since we didn't see it moving to the left or right, we knew that it was headed straight toward us. However, this was an ideal storm to chase since it was moving slowly. As we were watching this storm, yet another tornado warning was issued. We continued to watch the storm spin and spin. We knew it was going to drop a tornado, but the question was when. The National Weather Service warnings for this storm allowed everyone in the path plenty of lead-time, so they should have been prepared and in shelter. Finally, at 7:03 pm, the first of many tornadoes touched down. There was little visible funnel, but the dust swirls on the ground were certainly rotating. In fact, multiple vorticies were observed at the time this picture was taken. The tornado remained on the ground for a while. The tornado had this appearance for about 5 minutes. While this one was still there, another tornado formed. 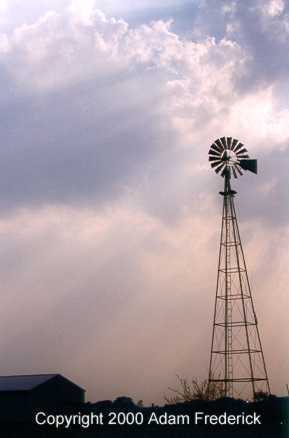 This needle tornado formed to the right (north) of the first tornado. 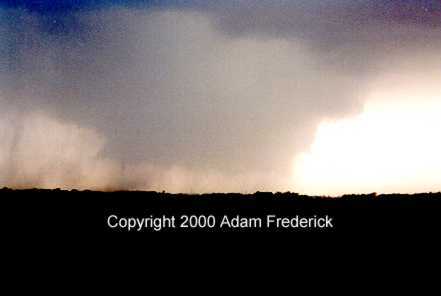 Like all tornadoes, it was kicking up dust and debris. Thankfully, this was out in the country and at this time was not affecting many homes. Both tornadoes were moving to the left (south), while the whole system moved toward the east. At 7:10 pm, there two needle tornadoes on the ground roughly 4 miles to the north of the Waterloo city limits. 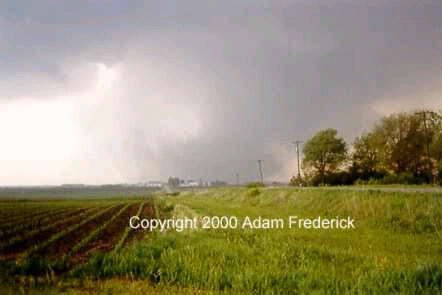 As you can see in the picture with the adjusted contrast, there were two tornadoes. The first is the original one, which is on the extreme left side and can be denoted by the skinny rope-like feature and the dust swirl on the ground. 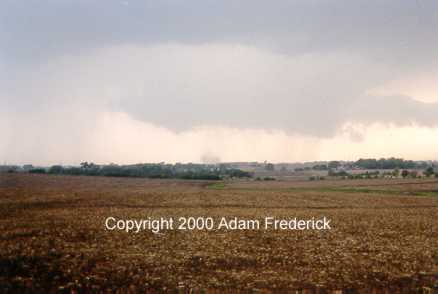 The second needle tornado is easily seen under the wall cloud. You can also see that this storm's circulation was really wrapping up tightly. The mesocyclone and rotating wall cloud were very well defined. 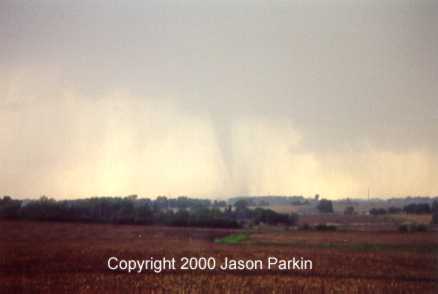 The second needle tornado eventually turned into a stovepipe tornado around 7:12 pm. The storm continued to move to the east toward us. Finally, we decided that it was time to move further to the east to make sure that we stayed ahead of this storm. We drove east on C-66 toward the city of Dunkerton, Iowa, with the tornado closely following us. We had stopped to watch the tornado for a little while then continued on our way. Below is an actual hourly observation from the Waterloo Airport. Very rarely do you see "TORNADO" listed in the remark (RMK) section. We continued east on C-66 with the tornado to the west behind us. As we looked back around 7:25 pm, we saw a satellite tornado form about 400 yards from our vehicle. Because we were moving, we didn't get a still picture of it, but video snapshots and video clips are coming soon. After we got a safe distance in front of the tornado, we stopped once again to look at the tornado. It was now obvious that this tornado was travelling right on or just north of C-66 headed toward the city of Dunkerton. We again continued to drive further to the east when the tornado started to get too close to us. Because of the intensity of the storm, we kept a little more distance between us and the tornado to avoid any debris that it may have been kicking out. We drove through the city of Dunkerton as many residents were standing in their yards looking at the tornado. When they saw our news truck, they pointed toward us and then pointed toward the tornado. They must have thought that we didn't know about it. Hopefully, they took shelter in time. Unfortunately, there were two serious injuries in the city of Dunkerton, and one of those injured later passed away from her injuries. We continued through Dunkerton on C-66. At this time, we knew that the amount of precipitation falling from the storm was increasing. Also, the station that we had been reporting back to asked us to bring video back for a 9:10 CBS uplink. So, we decided to get out of the path of the storm by going south on V-62 toward the city of Jesup. We were now at an angle where it was hard to see the tornado because of the rain in the background. Around 7:54 pm, we were about 4 miles to the north of Jesup. The storm was close enough for us to clearly see it, although the contrast was still poor because of the rain behind it. 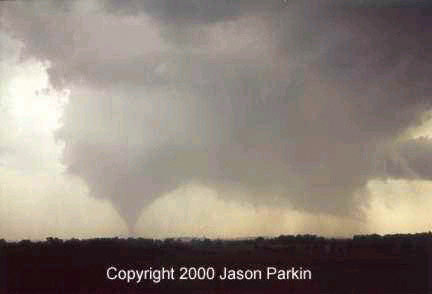 It was at this time that we could see two tornadoes on the ground. It appeared that one was coming out of an old wall cloud that seemed to be rotating around the storm. The other tornado was from a new wall cloud. 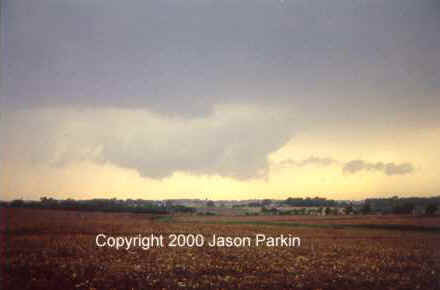 A few minutes later, three tornadoes were observed with this storm. The tornado crossing the road is easy to see in this picture. 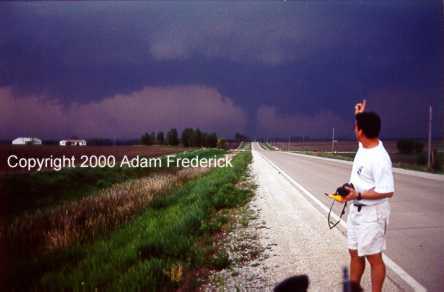 The second tornado is behind Jason's hand, and the new, third tornado is behind the house on the left (to the west of the road). Soon after this, we decided to abandon the chase to get back to the station in time for our uplink. We could have tried to follow it by going further east, but we figured that we were fortunate enough to see what we had seen. The unfortunate part of the day was all the death and destruction. For our coverage of the severe storms through many reports to the National Weather Service in Des Moines, one of our members Adam Frederick was awarded a certificate of Outstanding Performance for Severe Weather Coverage on this outbreak. We took many pictures and lots of video on this trip. These images can be seen in our photo gallery. have little or no experience and/or storm structure education. Learning to deal with these is best done by understanding supercells and thunderstorms, and riding with an experienced chaser before attempting to chase on their own. The author of these pages does not encourage storm chasing and is therefore not responsible for any actions as a result of what is seen here! For questions or comments about this page, please visit our "Contact Us" page. Content and Images (unless otherwise noted) Copyright 2000 Weather Edge Inc. Images and content may not be used without written consent. If you are interested in the purchasing of pictures or video, please contact the webmaster.